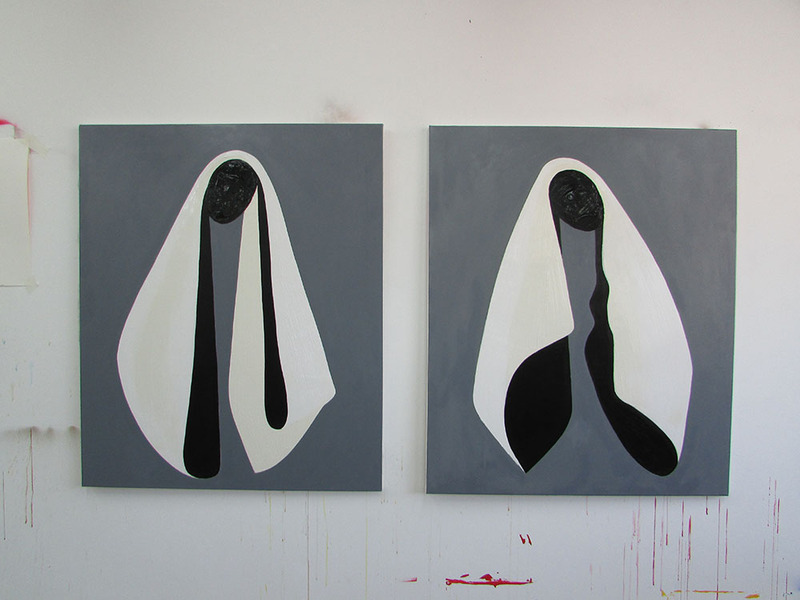 Through our interview blog feature INSERT NAME we are getting to know four final year BA Painting students who undertook one week residencies with The Fine Art Collective (TFAC) at Griffin Gallery throughout March and April this year. 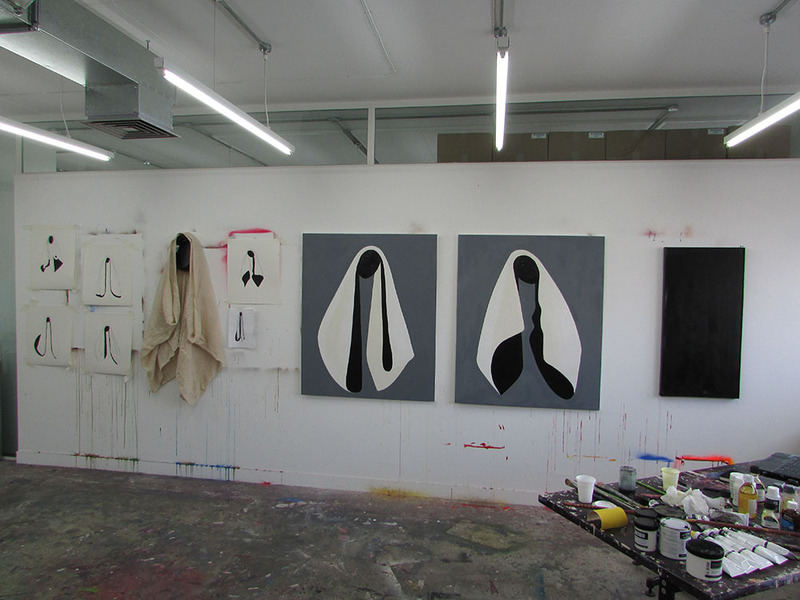 BA Painting students at Camberwell were given the opportunity to apply for one week residencies at Griffin Gallery. 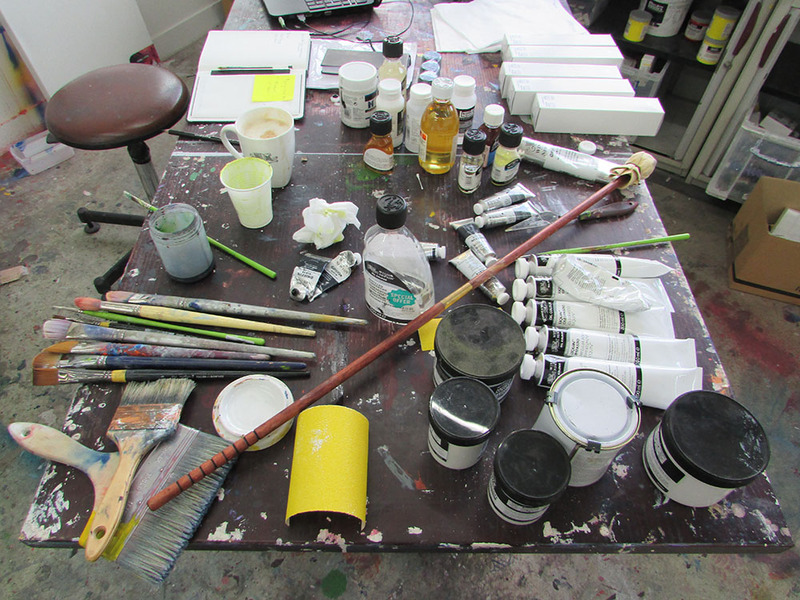 Six students were chosen to partake, all in 3rd Year of BA Painting and graduating in June. Each student had a week working in a spacious and professional environment. The students embarked on a short and intensive period of experimentation with materials of choice from Liquitex, Windsor and Newton, with the intention of informing and enriching their painting practice. The six students chosen were Esra Vazirally, Alice Mears, Swathi Srinivasan, Christopher Simpson, Victor Leleca and Florence Main. Christopher Simpson was the first April residency, he choose to specialise in Windsor and Newton materials. Christopher is a London based artist, but has shown his work in exhibitions in India, Italy and London. 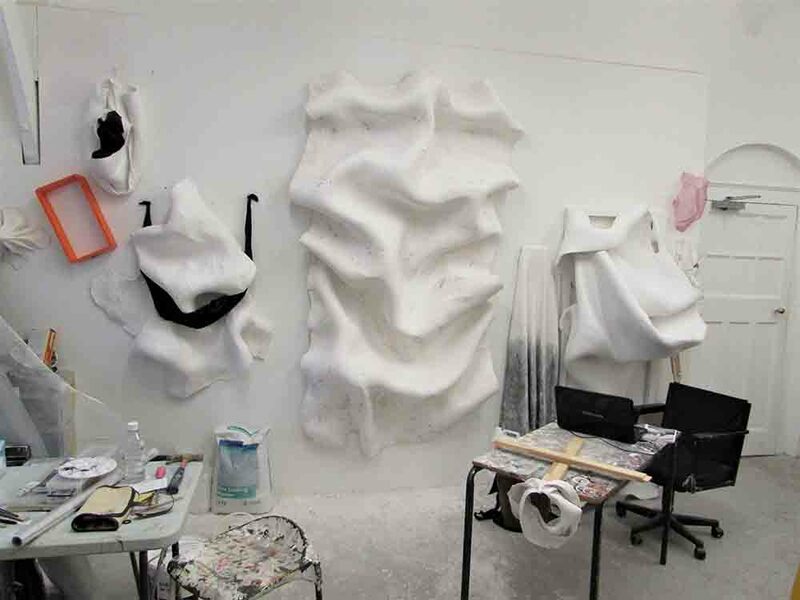 Before studying painting at Camberwell he spent many years working as an international makeup artist becoming increasingly aware of the power of materiality as an object of desire, luxury and comfort. It can be used as a language of self-expression or it can relegate the subject to concealment. Christopher’s work covers general themes of identity, the right to co-exist and the absence or presence of the human form in the world today. His recent body of work explores the hybridity between the processes of painting and sculpture and is heavily influenced by the work of the Italian Risorgimento movement that aided the unification of Italy in the 19th and 20th centuries. It was fantastic to have such an amazing studio space for the week, one of my favourite things was the message on the back of the studio door from the team at the residency space which read “Welcome to your studio, have fun and play”. We were allowed to use as much of the materials as we liked and were encouraged to experiment. Throughout the week I had plenty of visits from the various employees from the different departments who seemed genuinely interested in how I was spending my time in the studio and my discoveries. I had a long way to travel each day from my hometown of Barking in East London but was happy to have as much time as I needed in the studio. Why did you decide to apply for the Griffin Gallery Fine Art Collective Residency? I decided to apply for the residency as I have been very interested in the science and the history behind oil paint. I have been using Windsor and Newton my whole life and having the opportunity to go behind the scenes and spend time with the colour men and women from the Development Labratory is a rare things for painters today. Have you completed a residency before? Yes, I was invited to join the Atina art residency in Rome in 2015 along with 20 other artists. It was a very exciting challenge and working alongside artists at various stages in their career was a very valuable and educational experience. Witnessing the work of Bernini, particularly ‘The ecstasy of Saint Teresa’ my work began to take on a more investigative yet deconstructed approach of form, from two-dimensional towards the third dimensional. What research did you undertake during your week? I hadn’t worked with the fast dry (Alkyd) oils by Windsor and Newton before and was intrigued to see how much faster I could execute a piece of work. Talking to the scientists in the lab helped me work out which mediums would work well and what wouldn’t. Did you learn anything new or interesting regarding technique or with materials? I had been using Damaar varnish a lot in by previous paintings but found that with the Alkyds they were not needed as they would have slowed down the drying time and would have destabilised the paint meaning that the longevity of the painting would have been at risk of deterioration further down the line. 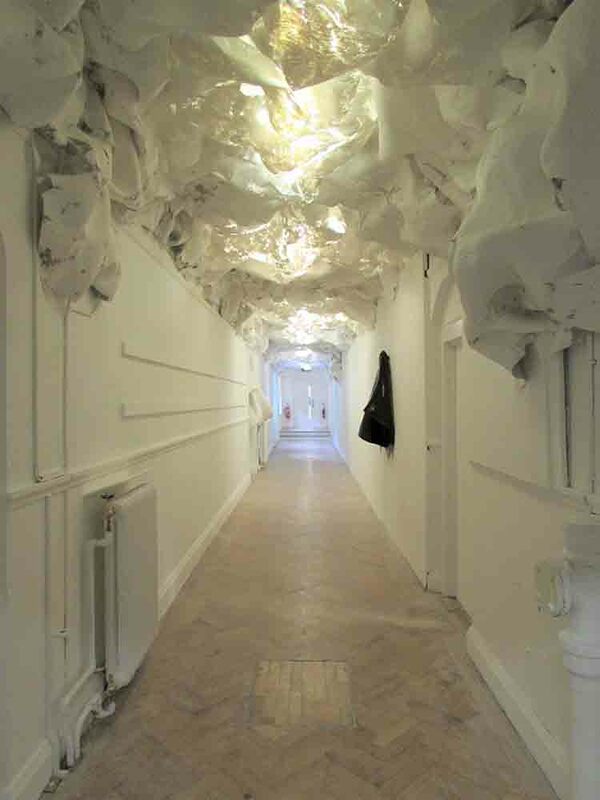 Did you take away anything from the residency that will further your practice or your final project at Camberwell? Apart from a generous supply of materials, the Alkyd paint is definitely something I will consider using on another residency. I couldn’t wait to get back to Camberwell and include what I learnt into my body of work as I worked toward my final degree show. Christopher’s most recent piece (and probably his most ambitious to date) brings together the last three years of his journey as an artist and he feels that he has finally begun to lift the veil, literally, by painting a twenty metre, three-dimensional installation onto the ceiling at Camberwell, loosely referencing the work of Michelangelo’s Sistine Chapel or Robert Morris’s 1960’s passageway he has finally found a way to cover his audience and allow them to physically enter into his space. You can see this work by Christopher and the 3rd year BA Painting students will be displaying at 45-65 Peckham Road during the Summer Shows 17 & 19-24 June.